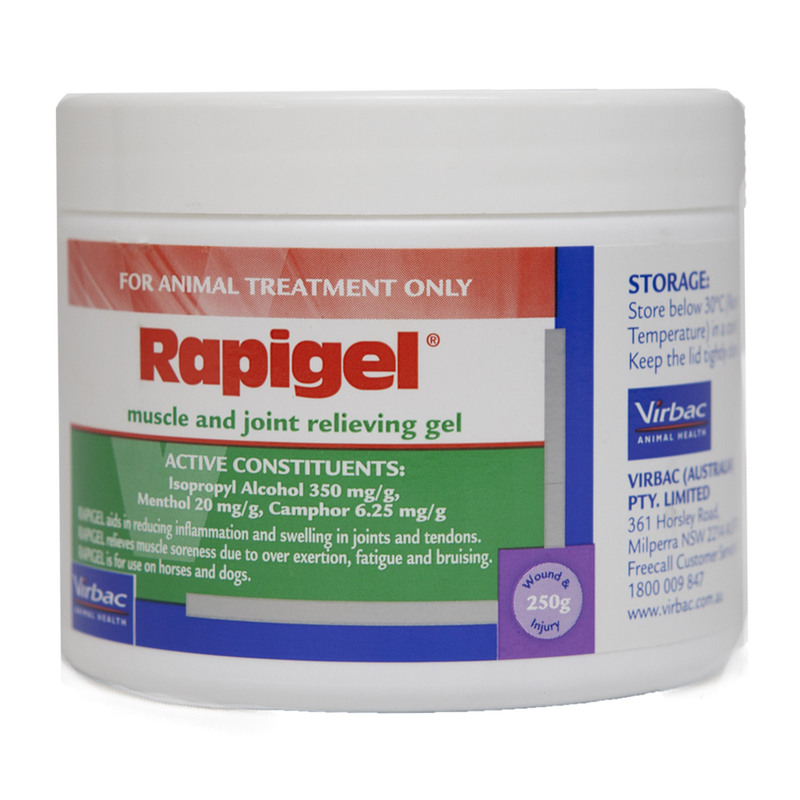 Rapigel is a powerful muscle and joint relieving gel for use in dogs. It greatly lowers pain or soreness associated with joint, muscle and tendon injuries. It relieves joint inflammation and pain due to dog arthritis. The soothing gel is helpful for swollen and inflamed joints and tendons. Rapigel is very beneficial for dogs undergoing training as it assists to warm up helping to prevent injuries due to strenuous exercises. The gel based cream aids to recover from intense exercises and overexertion. Rapigel contains three major ingredients Menthol, Camphor and Isopropyl Alcohol. The integrated effect of all these components helps to soothe muscle constraint and relaxes muscle spasm and muscle fibres. The potent formulation is effective in lowering the intense pain after training or exercise in dogs. It greatly reduces joint swelling and offers cooling effect while promoting tendon repair. Clean pet leg and gently rub onto the swollen area. Apply two times a day. Can also be applied under bandages. To be used before and after work out. Use when there are signs of inflammation, swelling or pain in joints. Use before exercise as an aid to prevent joint and muscle pain and afterwards to relieve aches and pains. Rapigel is an excellent relieving gel for soreness, pain and even bruising. This is an easy to use treatment that lasts longer. 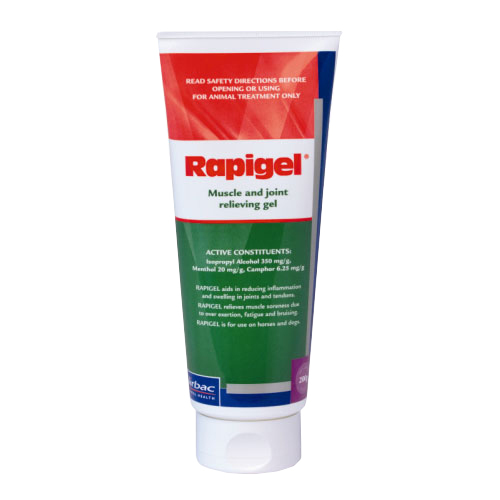 Rapigel is a no-mess stable gel formulation for dogs to work in all temperatures. It assists to warm up in order to prevent exercise induced injuries. The gel based product helps to recovery faster from intense exercise or training. Rapigel also acts as skin cleanser as it assists in removing a product or bandage residue that is left by adhesive bandage. Do not apply on wounds or broken skin. Store the product below 30°C (Room Temperature) in a cool place. No contraindications found on using this product. If pain persists in animals, visit a vet. A powerful and effective product for lowering pain or soreness associated with joint, muscles and tendon injuries. I used to think that I over-exercise my dog before using this gel and now after such positive effect of this gel on my baby I am happy. My dog was having severe pain in joints. The vet recommended this product and after two days, I could really see the difference in my furry pal from his walking and other activities.